1. For the pastry, pulse the flour, almonds, icing sugar and a pinch of salt in a food processor. Add the butter and pulse to breadcrumbs. Mix the egg yolks with 1 tbsp ice-cold water and drizzle in, pulsing until the dough starts to clump together (but stop well before it forms a ball). Tip onto the work surface and, using your hands, gently bring together to a uniform dough. Divide into 2 pieces, wrap separately in cling film, and chill for at least 1 hour. 2. For the filling, bring the vanilla and milk to a simmer in a small saucepan. In a bowl, whisk the whole egg, yolks, sugar and cornflour until smooth. Whisk the simmering milk into the egg mixture, then return to the pan and cook, whisking constantly, until it thickens. Pour the custard into a bowl, stir in the rum and leave to cool for a few minutes. Cover the surface with cling film and chill for at least an hour, or until completely cool. 3. To assemble, take 1 pastry piece and roll out on a lightly floured work surface to 0.2cm-0.3cm thick. Using a 10cm scallop-edged cookie cutter, stamp out as many rounds as you can. Lightly grease a 12-hole muffin pan and place a strip of baking parchment along the base and up the sides of each hole, like a sling (this will help to remove the pies later on). Carefully press the pastry into the holes and half-fill each with mincemeat. Fill each pie to the top with the custard from the fridge. 4. Roll out the second pastry piece; use a 7cm scallop- edged cutter to cut out 12 rounds. Prick each with a fork and use to top the mince pies, gently sealing the edges of the pastry together. Chill for 30 minutes or until firm. 5. Preheat the oven to 180°C, gas mark 4. 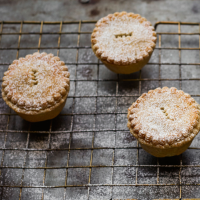 Brush the tops of the chilled pies with the beaten egg (and sprinkle with a little caster sugar, if liked). Bake for 25-30 minutes or until light golden brown. Cool for 10-15 minutes, then carefully remove from the tin. Cool fully on a wire rack, then dust with icing sugar, if liked.